I’ve just returned home from a 340km round trip to go for a surf at a semi-secret spot south of home; I decided to take my aging SWB GQ Patrol I call Shorty and after 4 hours of rattling and bouncing my way over dirt roads and sand tracks my ears are ringing, my shoulders ache and my backside is numb…and I’m still grinning from ear to ear. How good are old trucks? Modern rigs have really come into their own over the past few years and now provide outright off–road performance with comfort and superb reliability; without a doubt they are, in my mind, the future of 4WDing in Australia. However, if like me, you are an enthusiast driver, someone who enjoys the art (and I believe good driving is an art) then climbing behind the wheel of a 30 year old 4WD just has to tickle your fancy. Every act is a manual function; you really have to “drive” an old truck. Levers and dials exist that must be pulled and turned and read and obeyed. Your senses come alive but not always in an exotic perfume smell kind of way; often it’s more of an assault that shocks and leaves you reeling. It’s not for everybody but for those with it in their blood; its roots off-roading. Old Shorty is not high on comfort, in fact the driver’s seat has sagged so much I now sit on a piece of old yoga matt and it leans to the left alarmingly. The position adjustment has jammed in place so I don’t have a choice as to where I sit; thongs or boots it’s all the same. I’ve learned to compensate by sitting a little more forward and right in summer and further back in winter; this still makes me chuckle every time I get in. Sound deadening wasn’t a thing back in the day and an old TD42 with sucking turbo and straight through exhaust sure as heck doesn’t help; to say it’s a tad noisy in the cab is an utter understatement. Combine engine, wind noise and rattles and you’ve got yourself a cacophony of orchestral note, minus the talent. I now wear ear muffs when driving long distances which is always a hoot when someone passes or pulls up alongside. I smile and wave; having the time of my life. My speed and fuel gauges no longer work so it’s always a guessing game to balance performance and distance. I judge speed by the wind noise (the louder it gets the faster I’m going; when I can’t hear myself think I’m doing about 110km/h) and if I drive passed a fuel station and don’t top up, I’ve driven too far! I now pride myself on guessing speed to within a few Km/h and I reckon I can read a pending empty tank like a clairvoyant talking to the dead. Off-road the old girl is a weapon of mass destruction; meaning the harder I push the more destruction I do. Everything is mechanical and there’s not a hint of technological aid. An aging manual gearbox means I’m constantly reading revs and lockers keep all four wheels turning regardless of terrain. It’s a hell of a ride and I gotta be honest, it’s not for the faint hearted. The rear often wants to see what the front is doing and the roof has a weird fascination with the ground. Shorty forces you to be a better driver. It is back to basics off-road driving 101. I’m thankful to be able to get a dose of this as often as I feel I need it. It’s humbling. It’s also bloody good, old fashioned, wind in the hair, eyes wide open, teeth clenched, smile fixed…fun. I’ll take nothing away from the advent of technology in modern 4WDing; it is being done satisfyingly well and I’m keen to be a part of it. However, for as long as I can find the strength to engage a HD clutch and stay seated on a yoga matt bolstered seat, I’ll have an old school 4WD at my disposal. For no matter reliable and capable a modern vehicle might be, aint nothing makes me grin like a chimp and hang on for dear life like 35 years of antiquated 4WD history on a rutted hill. What’s your favourite thing about old-school 4x4s? Let us know in the comments below or join the conversation on Facebook. Seems to me like this vehicle is not road legal! What’s your favourite thing about old-school 4x4s? Passing them in my all wheel drive Subaru. A working speedometer is required by law, IIRC. At one stage I had to wear industrial ear muffs due to having 93 thou radial play on the transfer case main shaft. Spec was 3-5 thou ... Ugly! Its all about love to cars and to adventures. You must love it then you will love it with any car. Its not about doing it with old car or newer car. But i love they youtube videos and allways watch them. Some amazing trips they do . 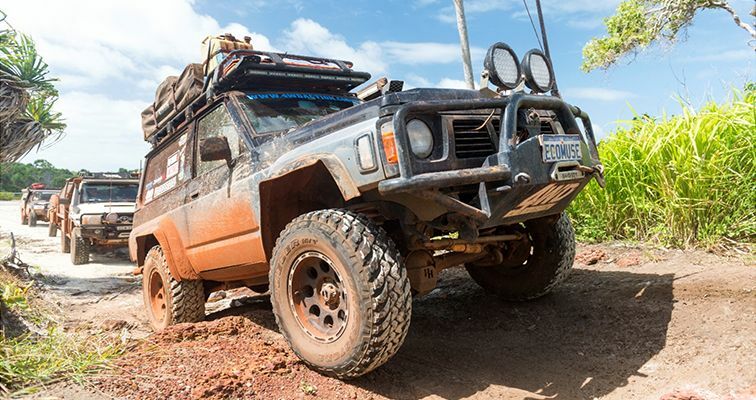 Thanks for sharing pics of your adventure and your reliable vehicle. All times are GMT -3. The time now is 09:58 PM.